Ferruccius (Dante Michelangelo Benvenuto) Busoni (Empoli apud Florentiam, 1 Aprilis 1866—Berolini, 27 Iulii 1924) fuit clavista, compositor, dux orchestrae Italicus. Beaumont, Antony. 1985. Busoni the Composer. Bloomington: Indiana University Press. ISBN 0-253-31270-1. Couling, Della. 2005. Ferruccio Busoni: "A Musical Ishmael." Lanham, Terrae Mariae: Scarecrow Press. ISBN 0-8108-5142-3. Dent, Edward J. 1933. Ferruccio Busoni: A Biography. Oxoniae: Oxford University Press. Roberge, Marc-André. 1991. 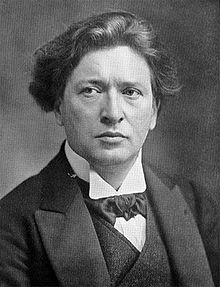 Ferruccio Busoni: A Bio-Bibliography. Novi Eboraci, Westport (Conn.), Londinii: Greenwood Press. ISBN 0-313-25587-3. Vicimedia Communia plura habent quae ad Ferruccium Busoni spectant. Novissima mutatio die 24 Aprilis 2015 hora 22:42 facta.